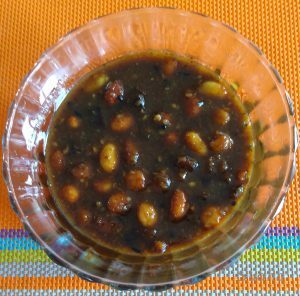 This chutney is generally made on Auspicious occasions as a part of Prasad (Offering to God) Platter. This is one of the forgotten specialties from Maharashtra. It is not to be mistaken for Panchamrut / Charanamrut which is Teerth (Auspicious Mixture) that is made for any Pooja. That contains Milk, Curd, Ghee, Honey and Sugar. This Panchamrut has five basic ingredients – Tamarind, Jaggery, Peanuts, Dry Coconut and White Sesame Seeds. 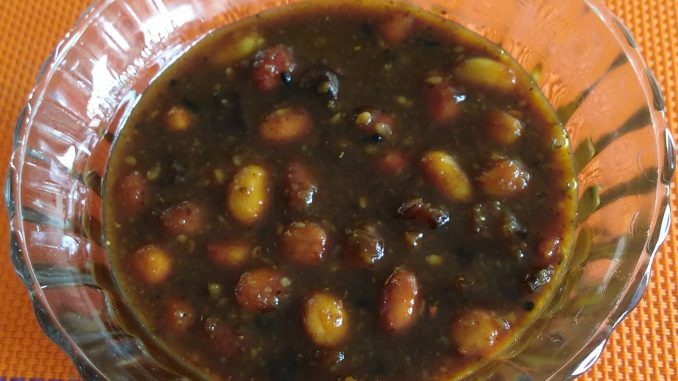 It’s a very easy recipe and makes yummy Chutney. We had it with Thepla. 1. Dry roast white sesame seeds. After cooling grind into a coarse powder. 2. In a pan, heat oil on medium flame. 3. Add Mustard seeds; wait for splutter. Add Turmeric Powder and Asafoetida (Hing). 4. Add Raw Peanuts. Sauté for 2-3 minutes. 5. Add Dry coconut slices. Sauté for 2 minutes. 6. Add Tamarind pulp. Bring the mixture to boil. 7. Add Jaggery. Cook for 3-4 minutes. Add water if mixture is dry. 8. Add Sesame powder, Salt. Mix. Bring to boil. 9. Panchamrut will thicken as it cools. So don’t make the mixture very thick. 10. Panchamrut is ready. It’s very tasty. Serve as Chutney with Roti / Thepla (Indian Breads). 1. You can add 2 table spoons of chopped cashew nuts also. Add those after you sauté dry coconut pieces.